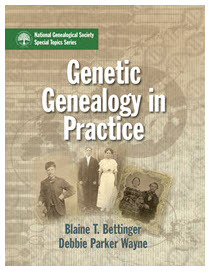 Blaine T. Bettinger and Debbie Parker Wayne, Genetic Genealogy in Practice (Falls Church, Va.: National Genealogical Society, 2016). Bettinger, Blaine T. and Debbie Parker Wayne. Genetic Genealogy in Practice. Falls Church, Va.: National Genealogical Society, 2016. Order the print version from Amazon or National Genealogical Society (click the plus sign next to "NGS Books" then clcick the book title). Price is $30.06 for NGS members, $36.05 for non-members. The print version is best for working the exercises. The Kindle version ($9.99) is available from Amazon. This is the first genetic genealogy workbook. This book covers the biological basics, types of DNA testing that are useful for genealogy, and analysis techniques needed for successful genetic genealogy. No matter which company a person tested at or which tools are used for data collection and analysis, the information in this book will help a researcher correlate DNA evidence into a family study. After presenting the concepts of genetic genealogy and the techniques used to analyze the test results, each chapter concludes with typical genealogical questions as exercises. An answer key provides immediate feedback to the reader as to whether he or she arrived at the expected conclusion and what concepts, evidence, and analysis techniques should have been considered while working the problem. Readers will be able to apply the knowledge gained to their own family history to make credible conclusions using DNA test results. This extracted paragraph explains why all genealogists need to understand DNA, even if you aren't yet using it yourself (but why aren't you?!). The current generation of genealogists faces a new challenge, namely incorporating the discussion of DNA evidence into genealogical writings. Genealogists must understand how to correlate DNA evidence with documentary evidence to analyze a genealogical question, and they must also understand how to present DNA evidence as one of the elements supporting a conclusion. Genealogists who are not yet using DNA in their own writings must grasp enough of the subject to be able to evaluate the writings of peers who are incorporating DNA. DNA can seem complex to many of us, but this book will guide you and help build your knowledge level one step at a time. The researcher who is new to genetic genealogy may want to come back to the book and review more advanced concepts after gaining some experience with the basic techniques. The amount of time you can devote to studying is limited only by yourself, not a conference or institute schedule. And you can do it all from home. Blaine and Debbie planned for and worked on this book for almost two years. After teaching week-long genetic genealogy courses at the Genealogical Research Institute of Pittsburgh (GRIP), Institute of Genealogy and Historical Research (IGHR), and Salt Lake Institute of Genealogy (SLIG), students want more hands-on time to practice what they have learned. Teaching important concepts limits the time available to devote to exercises. This book provides new and real genealogical problems those students, and all researchers, can practice on at their own pace. After mastering an application, the knowledge can immediately be applied to your own family history project. This book brings together the genetic and the genealogy concepts and techniques needed to solve family history problems using DNA as one more tool in the genealogy toolbox. The objective in writing this is to see more researchers effectively using DNA in a family study and publishing those findings for all genealogists to learn from. Mary Penner, "Book Review: Genetic Genealogy in Practice," New Mexico Genealogist 56, No. 1 (March 2017): 46. Michael Lacopo, "Review: Genetic Genealogy in Practice," APG Quarterly XXXII, No. 1 (March 2017): 39. The Legal Genealogist, "Buy this book!" Deb's Delvings, "New Book Coming Soon: 'Genetic Genealogy in Practice'"
Deb's Delvings, "'Genetic Genealogy in Practice' is HERE!" Deb's Delvings, "'Genetic Genealogy in Practice' topics and sub-Topics"